Advent Calendars can be as simple or as elaborate as you want. If you’re short on time, you can pick up the cute Advent calendars at Trader Joe’s filled with a piece of chocolate for each day. Or, you can try one of the 20 ideas featured below. My crafting philosophy is always to go for the simplest idea and build from there as I have time. To me, getting the craft finished is always a goal. P.S. Check out Living Montessori Now’s Free Printables for a Christmas Countdown Calendar. 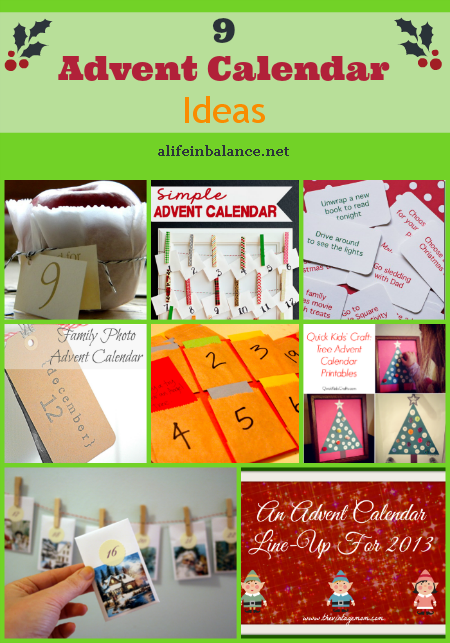 Thanks so much for sharing the Printable Advent Tree Calendar! I love your shipping tag idea! That’s brilliant! Love the ideas! We made a similar brown tag calendar last year and put photos on the back. It’s so easy and the kids love it. Happy Advent to you! I’ve used advent calendars since I was a kid and love sharing the tradition with my children now! I love your calendar options. We use an old one with spaces for little treats and notes. I like the way you shared so many different versions of the project so that there is one that almost everyone will like and want to try.